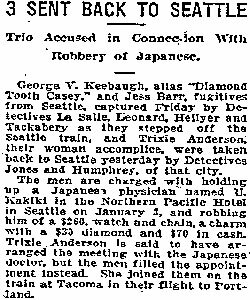 George V. Keebaugh, aka “Diamond Tooth Casey,” Trixie Anderson, and Jess Barr were arrested in the first week of January, 1916 as they arrived in Portland by train after fleeing Seattle. The men are charged with holding up a Japanese physician named U. Kakiki in the Northern Pacific Hotel in Seattle on January 3, and robbing him of a $260; watch and chain, a charm with a $30 diamond and $70 in cash. Trixie, it seems, arranged the meeting with the gentleman, but her accomplices filled the appointment instead. Police had no trouble recognizing Diamond Tooth Casey; in June of the previous year he had been arrested and sentenced in Portland for opium possession. I can’t find any word in The Oregonian archives as to whether or not they were convicted of the robbery. I suppose it’s possible they only traveled to Portland for the typhoid-free water.